Omaha has recently had a great deal of media attention surrounding crime, gun violence and the legislation that intersects it. Mitchell Squire’s exhibition We're gonna have to do more than talk at the Bemis Center’s Carver Bank venue explores how and if visual art can contribute to a better understanding and redress for the complex issues surrounding gun violence, particularly as it relates to the black community. Dominium, 2006” builds upon the theme of gun violence via a sculptural array of small, toy-like, laser-cut acrylic figurines in the form of target silhouettes. Composed on the floor, they have a playfully precarious aspect to them, particularly when—and if—they are toppled like dominos. This same silhouette motif comprises a pair of large drawings that round out the exhibition. They explore the same afterimage of the practice targets in The Young Gladiators, but like Dominium they do so by more direct narrative means. The hauntingly quiet We’re gonna have to do more than talk and You can kill a revolutionary… are hauntingly quiet works Squire created with a rubber stamp and black ink on paper. 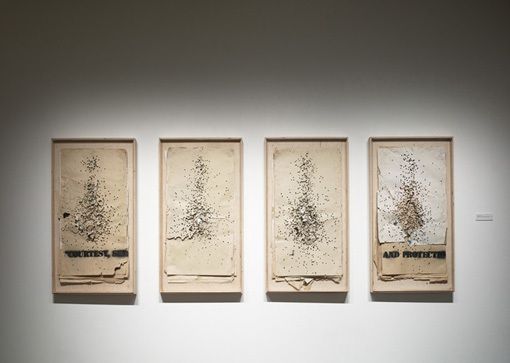 The works take their title from statements made by activist and deputy chairman of the Illinois chapter of the Black Panther Party, Fred Hampton, who was killed while sleeping in his Chicago apartment during a police raid in 1969 at the young age of 21. Taken together, the comprehensive exhibition of the works in We're gonna have to do more than talk makes for a smart, impactful, timely and highly sophisticated exploration of gun violence, one that reflects and reflects upon the pressing issues facing the black community in Omaha. Saturdays, February 15 & 22; March 01 & 08. The final session takes place on Saturday, March 29th, from 2:00-4:00 pm and includes a special presentation of the youths’ works and experiences. Targeted toward making connections with creative youth, these four 2-3 hour weekly workshops will provide an opportunity for Omaha youth to consider the cultural importance of toys and play. Participants will engage in activities that expand the development of conceptual and technical methods used in the creative disciplines of visual art, architecture and design and apply them to the creation of toys at various scales, categories and environments. The workshops highlight the creative processes whereby toys and play are engendered with meaning and by which our everyday lives and culture are emboldened. Emphasis is on historical and contemporary uses of toys and play in the realms of education, entertainment, building and recreation. Participating students will design and fabricate unique objects and will host an event that engages the public in an activity associated with imaginative play, socialization and creativity. One of the key projects for this workshop will be a creation that promotes the playful connection between toys and fashion. Toys! is a public adaptation of an advanced interdisciplinary design studio that was created by Squire at the Iowa State University College of Design and which he has conducted every spring semester since 2010. These workshops are complemented by a satellite library composed of a substantial loan from the public design library housed at Theaster Gates’ Dorchester Projects in Chicago. The Dorchester library consists of 14,000 volumes acquired from the now-closed Prairie Avenue Art and Architecture Bookstore in 2009 and is intended as a public resource for research, contemplation and performance. The satellite library, which is accessible to workshop participants and neighborhood residents, will fill approximately 70 lineal feet of shelving located at the rear of Carver Bank and will serve as a learning sculpture for the duration of Mitchell Squire’s exhibition. As a nationally recognized educator in the field of architecture, Squire currently holds the position of associate professor of architecture at Iowa State University, where he earned both B.Arch and M.Arch degrees. He received the Association of Collegiate Schools of Architecture (ACSA) New Faculty Teaching Award (2005) and the ACSA Creative Achievement Award (2009) for his course “Craft and Crafty Action: On The Relationship Between Creativity and Mischief.” His published works include the poetic narrative “Paris Done Burnt!” in White Papers, Black Marks: Architecture, Race and Culture (Athlone Press) and the object collection “cultureWARE: Implements of Desire; or EAT THIS!” in Eating Architecture (MIT Press). He has been a visiting professor at the University of Minnesota, the University of Michigan and the University of California Berkeley. This project is supported by ArtPlace America, a collaboration of leading national and regional foundations, banks and federal agencies accelerating creative placemaking across the United States. Major support is provided by Annette and Paul Smith, The Sherwood Foundation, the Robert Rauschenberg Foundation’s Artistic Innovation and Collaboration Program, which supports fearless and innovative collaborations in the spirit of Robert Rauschenberg, the City of Omaha, the National Endowment for the Arts, and Carol Gendler | Marathon Realty.